The Mummy's Curse...Not So Fast! 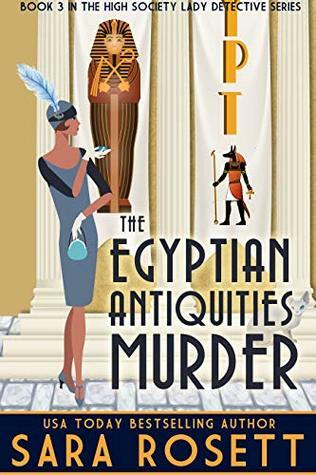 The Egyptian Antiquities Murder took me once again into a period in Britain that has always fascinated me. The period between WWI and WWII was an era of tremendous social change, not least for our High Society Lady Detective, Olive Belgrave. Olive was gently born and never expected to be left virtually penniless due to her feckless father's bad investments. Rather than retreating into the country with her father and his unwelcoming new wife, Olive is determined to make it on her own. In books 1 and 2 of the series, Olive has had some success investigating problems in "society" that could never be entrusted to the police or the lesser-born. She was delighted to receive a letter from the niece of Lord Mulvern who recently died. The police declared it a suicide, and the press speculated that it was the result of a "mummy's curse." His niece, Lady Agnes, declares that he had no reason to commit suicide and the mummy's curse merely is nonsense. The investigation turns out to be more difficult than Olive expected. Lady Agnes and other family members and staff prove to be less forthcoming than Olive expected, and she is deprived of her partner, the mysterious Jasper's assistance throughout most of this book. I always enjoy Rosett's deft descriptions of the fashions and manners of the period which inform but never intrude on the story. I am looking forward to the next book in the series (with more Jasper, I hope). Thanks to the author for an advance digital copy. The opinions are my own. I have read probably more books, more theories, and watched more TV programs, about Jack the Ripper's identity than anyone should. Despite having a reasonably good knowledge of the lives of women and the poor in18th and 19th century England, I never gave much thought to his victims. The Five is about 130 years overdue in bringing Polly, Annie, Elisabeth, Kate, and Mary Jane to life. It is all too easy to gloss over them and accept the prejudices of society and the press. The first disturbing fact, at least to me, is that four out of the five women were in all probability, not prostitutes. Only Mary Jane Kelly had a provable history of prostitution. It does not matter whether they were or not. They had merely fallen on hard times, were without dependable male support and lived in a society which set up impossible expectations for women and the poor. The laws and attitudes of the time placed more obstacles in their path than help and actively conspired to make women's lives difficult, if not impossible. The fact that women were reduced to sleeping on the streets did not automatically make them prostitutes or criminals. Alcohol use was also a contributing factor to the downward trajectory of the women's circumstances. Gin was the universal escape for both the men and women of the working classes, and violence invariably followed. 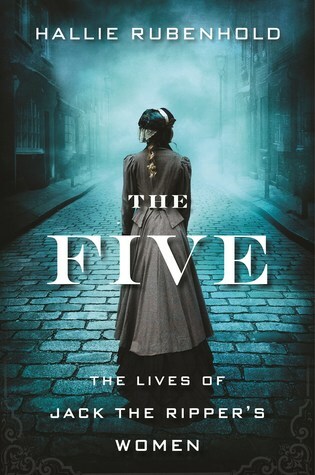 The Five is an exhaustively researched narrative that kept me ricocheting between tears and rage. It is incredible that so much material is available on three of Jack's victims. The other two are less well-documented, especially Mary Jane, who never seemed to tell anyone the truth of her life. Rubenhold does make assumptions about them, but to me, the premises are well based on fact. I recommend The Five without reservation to anyone interested in crime or social/women's history. Thanks to Houghton and NetGalley for an advance digital copy. The opinions are my own. The Department of Sensitive Crimes is the first in a new series from the internationally bestselling Alexander McCall Smith. To be honest, I thought I was one of the few readers on the planet who had not read any of his many books. I remember trying the audio of the first in his No.1 Ladies Detective Agency series, but I couldn't get into it for whatever reason. But when this book was offered by the First To Read program, I read the description and thought it might be time to try again. The Swedish city of Malmö has a department devoted to the investigation of crimes that appear to be somewhat off-beat. Crimes that just don't fit into the usual robbery/drugs/murder mode are investigated by lead detective Ulf Varg, and his colleagues, Anna Bengsdotter, Carl Holgersson, and Erik Nykvist. His colleagues are all individuals; Anna a married woman who works closely with Ulf, Carl the workaholic, and Erik the department clerk obsessed with fishing. However, Anna and Ulf are the closest; and Ulf is in love with her. Being the kind and gentlemanly man he is, he knows that he can't act on that and break up a family. Then there is the uniformed policeman, Blomquist, whose dearest wish is to be part of the department. The three cases investigated in The Department of Sensitive Crimes are indeed off-beat; the stabbing of a merchant in the back of the knee with no witnesses, a missing imaginary boyfriend, and possible supernatural goings-on at a spa. Ulf has other problems too. His dog, Martin, is suffering from clinical depression. 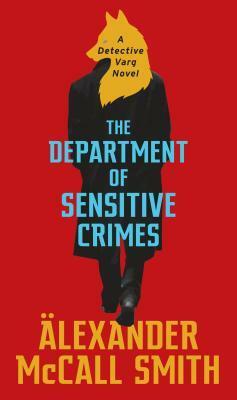 The Department of Sensitive Crimes is a charming if slightly odd book. I was captivated by the characters and the gentle philosophizing of Ulf. It doesn't fall into the Scandinavian "noir" category that we are so used to. I kept turning the pages late into the night just to see what might happen next and McCall Smith has a new fan. Thanks to the First To Read program for an advance digital copy. The opinions are my own. After He Died opens at the funeral of Paula Gadd's husband of nearly thirty years, Thomas. Paula is almost completely overcome with grief, not only for her seemingly fit husband's death by heart attack, but for the loss of her only child, Christopher, nearly seven years before by hit-and-run. Paula's life has been built entirely around both son and husband, and she has no idea what she will do. The service is packed with mourners, mostly business associates of Thomas, but few who have any real connection to Paula. Thomas' older brother, Bill, and his wife, Daphne are there, but that relationship is distant, at best. Paula's only real support is that of Thomas' other brother, a Catholic priest, Father Joe. What little composure she has is cracked when a young woman approaches and whispers in her ear, "You need to know who your husband really was. ", slips a note in Paula's pocket and moves away quickly. It takes several boozy days and an odd visit from Thomas' business partner, Kevin Farrell, who is carrying a palpable air of desperation to prompt her to call the number on the young woman's note. She is Cara Connelly, who comes from the slums of Glasgow and has raised herself to the position of a social worker in those same slums. She accuses Thomas of being an organized crime lord, and of a horrific crime. Paula dismisses this out of hand, but events conspire to make her and Cara uneasy partners to find the truth. Paula begins to see that she and Thomas had drifted apart since Christopher's death, especially in the last two years. Always a hard worker and very successful, Thomas was a full-blown workaholic at the end. Could Thomas have actually hidden a secret life from her? I admit that when I requested a galley of After He Died, I had the mistaken impression that it was from North Carolina author, Michael Malone, whose books I have also enjoyed. That was a fortunate mistake for me. 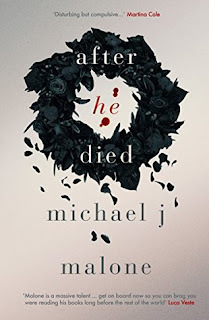 After He Died is a real page-turner, with fleshed out characters to both like and hate. Paula is someone I understand and empathize with, despite a tendency to ignore coincidences that would be red flags to anyone thinking straight. Paula, however, is so sunk in grief and denial that it takes a while for her to see facts for what they are. Cara, on the other hand, is so confident of what she knows, and so resentful of the "moneyed classes" she becomes blind in her own way. Both are complicated and ultimately likable women caught up in events, not of their making. 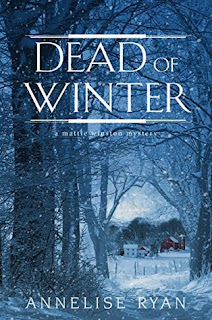 I highly recommend After He Died for fans of psychological suspense. Thanks to NetGalley and Trafalgar Square for a digital copy. The opinions are my own. 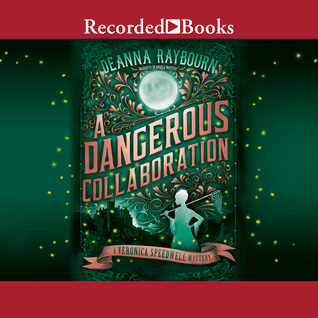 Downloading the newest book from the talented Deanna Raybourn on the publication date is a must for me, as it was for her earlier Lady Julia Grey mysteries. A Dangerous Collaboration begins with our intrepid globe-trotting lady lepidopterist packing to return from an extended "holiday" in Madeira with her patron's sister, not with her partner Revelstoke Templeton-Vane (Stoker). In fact, she has received not one letter from him, but numerous letters from his older brother, Tiberius. Stoker is distant upon her return, refusing to discuss the Madiera trip or anything else for that matter. A visit from Tiberius brings Veronica a new opportunity: an old school friend owns a secluded island off the Cornish coast with butterflies that are seen nowhere else. The friend might be willing to let Veronica establish a habitat on the mainland in the interest of averting eventual extinction. It's an opportunity not to be missed, but Stoker is not invited. On the journey to the island, Tiberius explains that Veronica will be posing as his fiance to avoid offending his host, Lord Malcolm Romilly's, Catholic sensibilities. Lord Malcolm's fiance, Rosamund, disappeared from the island three years earlier on their wedding day and the resulting scandal drove the family into exile from society. It is clear that this island visit is about more than butterflies, and Tiberius' motives are murkier than we thought. Not unexpectedly , Stoker shows up on the train at the journey's end and continues to the island. Superstitious villagers, devoted housekeepers, a bride who was not so innocent, an unconventional sister, and a castle riddled with priest's holes all play a part in the story, along with escapes from sure death; all leading to an unexpected solution. At least to me. As always, I found A Dangerous Collaboration most entertaining. The prickly, stubborn Veronica and Stoker are two of my favorite characters. However, I thought the ongoing "will they, won't they" bogged down the story somewhat. Especially since it's clear that they will when they get over themselves! Narrated by the excellent Angele Masters, I recommend the audiobook, but at some point, I will read the book as well. An early morning call brings Death Investigator Mattie Winston her most challenging case yet in this ten book series. A battered, nameless teenage girl has been left at the local hospital and has succumbed to her injuries. The man who left her disappeared, giving no information other than she supposedly was involved in a traffic accident. Upon examining the body, Mattie discovers many old injuries and evidence of IV drug use. The possibility of human trafficking is definite, not the norm in small Sorenson, WI. Even more troubling, the teenager indicated in her last words that her younger sister was being held. 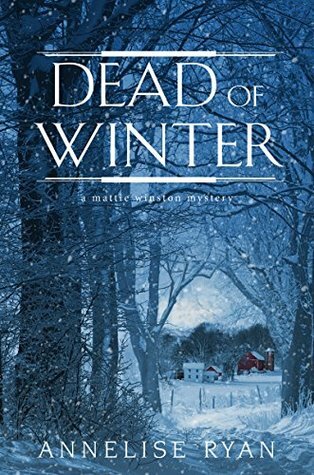 This event leads Mattie, her new husband Detective Hurley, and the Coroner's Department on a race to find the younger sister before it's too late. 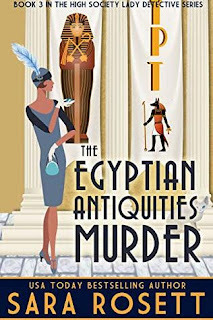 I have always enjoyed the Mattie Winston series for its well-constructed mysteries, often lightened with zany humor. I am somewhat disappointed by Dead of Winter, however, as the joke was of the "bathroom" variety and occupied too much of the storyline. A secondary case of domestic abuse against an acquaintance of Mattie's plays well into the main story. There is another murder at the local theater which had no relevance and felt like padding. The Mattie Winston series is taking on a darker tone, which I don't object to. Mattie is a likable character and doesn't have to suffer all the silly mishaps, especially those that are avoidable. While this book was a disappointment, I am not ready to give up on the series. Thanks to NetGalley and Kensington Books for an advance digital copy. The opinions are my own. There are times when one needs to leave all the strife and noise of daily life in the 21st century behind and dive into a novel without any of that sort of discord.Thankfully, H.Y. 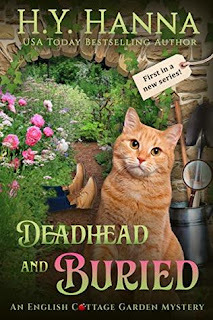 Hanna is prolific and always provides an escape, The first in her new series, Deadhead and Buried. Poppy Lancaster is a London city girl, who is all alone in the world after the death of her free-spirited but irresponsible mother. Her job is a dead-end, her boss is a harridan, and her only caring friend is her kindly landlady. Imagine her surprise when she receives a solicitor's letter with the news that she has inherited a property in the countryside from a grandmother she never knew. At last, it seems that Poppy will be able to sell the property, have some money to spare, travel a bit and perhaps find her father, who she also never knew. Upon her arrival though, she finds a run-down cottage, a defunct garden business and a body buried in a shallow grave. And perhaps a whole new life, far from what she has ever envisioned for herself. 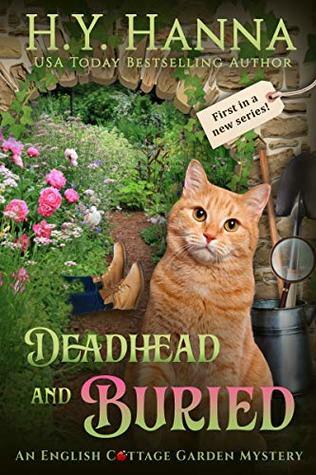 Deadhead and Buried is a charming and well-written cozy mystery with a likeable heroine in Poppy, and plenty of quirky characters. Poppy has an elderly "mad scientist" and a handsome but curmudgeonly crime writer for close neighbors, and a previously unknown cousin who thinks that he should have inherited. The bossy, talkative ginger cat, Oren, who adopts Poppy as his own adds to the plentiful humor. I am looking forward to the next book in the series, Silent Bud Deadly.